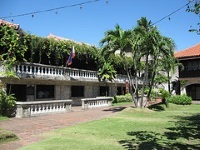 The Casa Gorordo Museum was originally the home of the first Filipino Bishop of Cebu. Four generations of the Gorordo family lived in the house between 1863 and 1979. It is now restored and serves as a re-creation of a typical well-off Filipino home of the mid to late 19th century, furnished with religious relics, paintings, antique furniture and household items. Almost all the household items and furnishings of the museum are authentic to the period and there is some wonderfully intricate woodwork on display. Most of the items have no labels, but this actually contributes to the pleasant feeling that one is exploring a genuine old home, rather than a museum, and the placement of objects in the different rooms usually clarifies their purpose anyway. Guided tours are sometimes available for those who want more information but those determined to have a guide should organise their own to avoid disappointment. Just wandering through the old house is fascinating, allowing travellers some real insight into how the family once lived. Often the museum also showcases some contemporary art exhibits, but the main attraction is the house itself. It is possible to buy postcards and other small souvenirs at the museum.